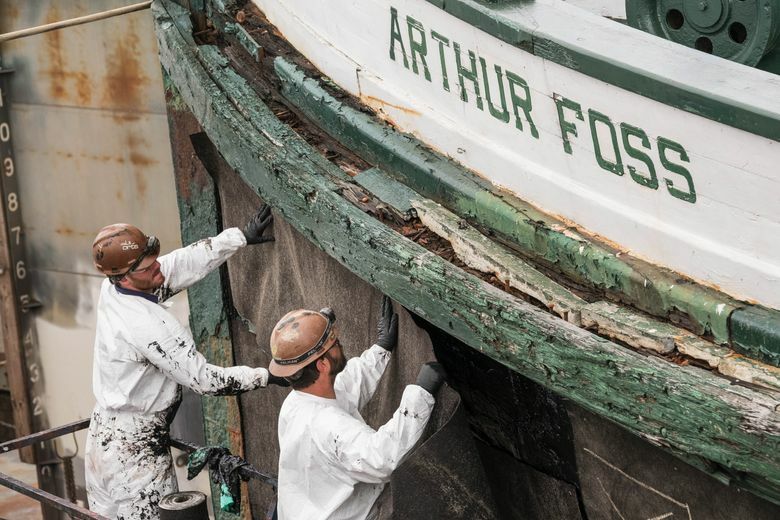 The Arthur Foss has been gone from Lake Union Park for roughly two weeks while crews made repairs, laser-mapped the hull and prepared to restore its entire hull. 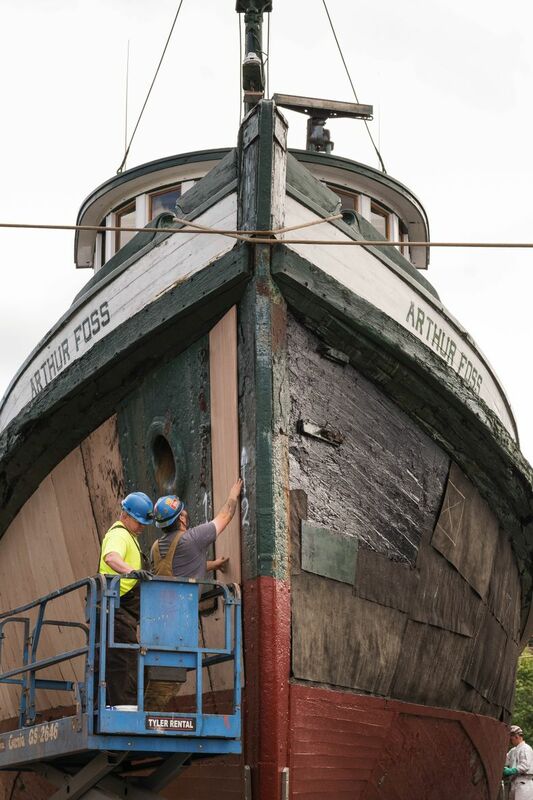 The Arthur Foss could be the oldest tugboat still floating in America, but the wood keeping out water is the same wood it had 127 years ago, says Nathaniel Howe, executive director of Northwest Seaport. “These planks haven’t seen sunlight since before 1900,” Howe said. 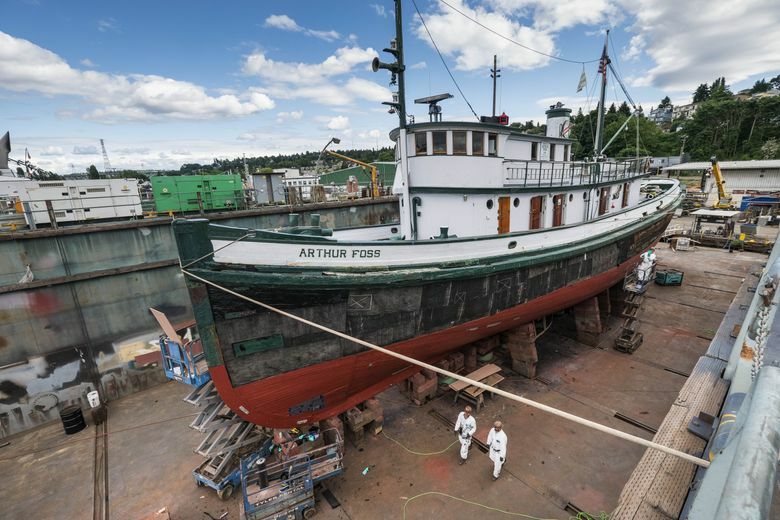 Usually moored at the Historic Ships Wharf as a floating museum on Lake Union, the boat has been dry-docked at Foss Shipyard for roughly the last 10 days for repairs and preparation for a much bigger restoration: the entire 120-foot-long Douglas fir hull. 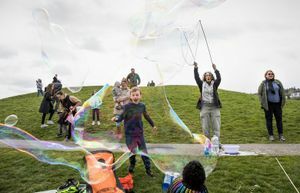 The ship will return to Lake Union Park on Monday or Tuesday. 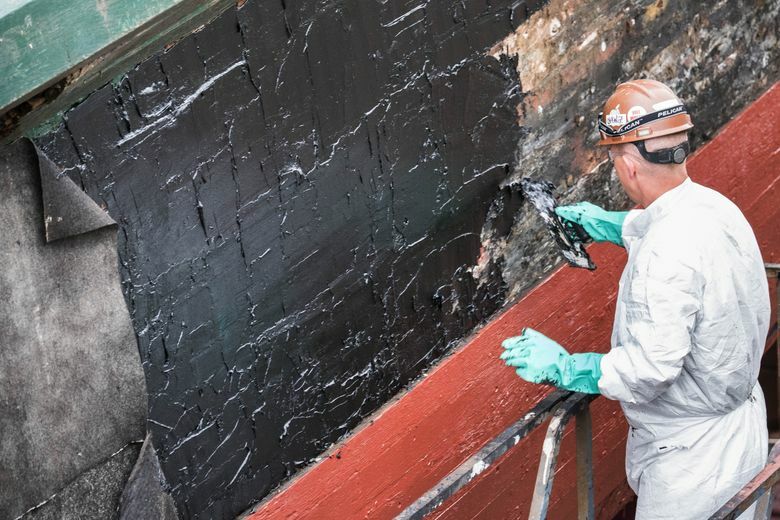 For nearly two weeks, shipyard workers, carpenters and welders worked double shifts from 7 a.m. to as late as midnight, repainting, chipping out flat, fist-sized slabs of rust, pulling off outer layers of wood to see how the original hull is doing, and tarring the underside to protect it for the next couple of years while they raise funds and prepare wood for the bigger restoration. Nautical archaeologists and naval architects have examined the hull to help plan its restoration in the next eight to 10 years. Northwest Seaport doesn’t have any blueprints of the boat — they were either lost or never made in the first place — so naval architects laser-mapped the hull to get a sense of the shape and size of it. “We’re getting to know every piece of wood,” said Shannon Fitzgerald, a member of Northwest Seaport’s board of directors. Howe said repairs in recent weeks cost $170,000 in grant funds. 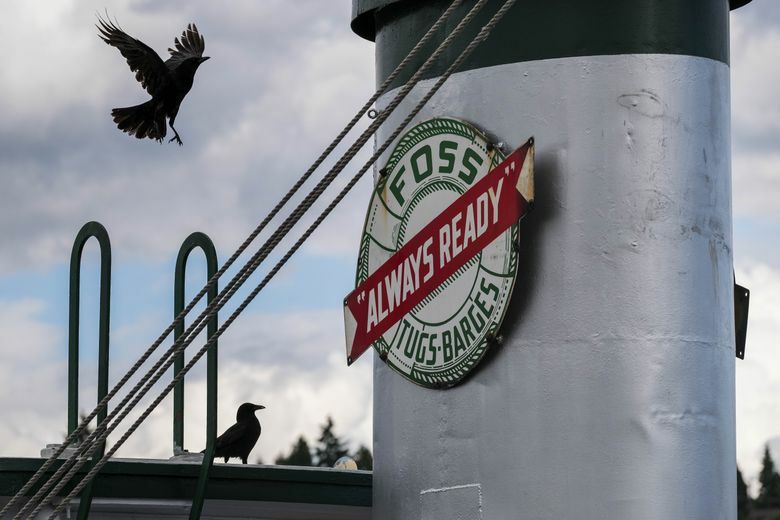 The Arthur Foss is a revered piece of Pacific Northwest history: Launched the year Washington became a state, the tugboat was built in Portland to move ships on the Columbia River. It was named the Wallowa originally and helped carry supplies and miners north during the Klondike Gold Rush, after which it came down to Puget Sound and was bought by the Foss Launch & Tug Co. (Foss Maritime today) and named after the owners’ oldest son in 1929, according to the Seaport. The Arthur Foss was at Wake Island when the Japanese invaded in World War II and was the last ship to escape, Howe said. 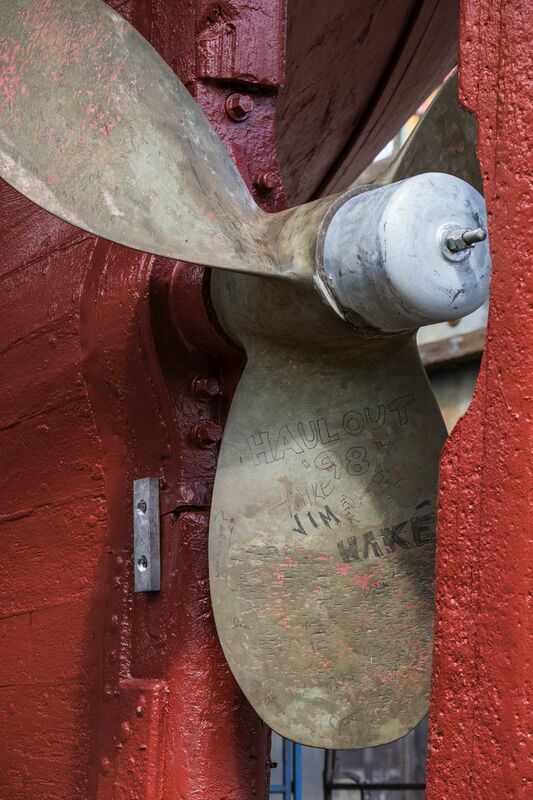 In 1970, the company donated it to Save Our Ships, which today is Northwest Seaport. The tugboat is regarded as a local icon. It appeared in the 1934 movie “Tugboat Annie,” which was filmed in the Puget Sound area. Documentaries have been made about it. It functions today as a floating museum, a hands-on classroom for apprentice shipwrights and even a spot for sleepovers. Howe says restoring the hull could cost up to $7 million over the next decade.